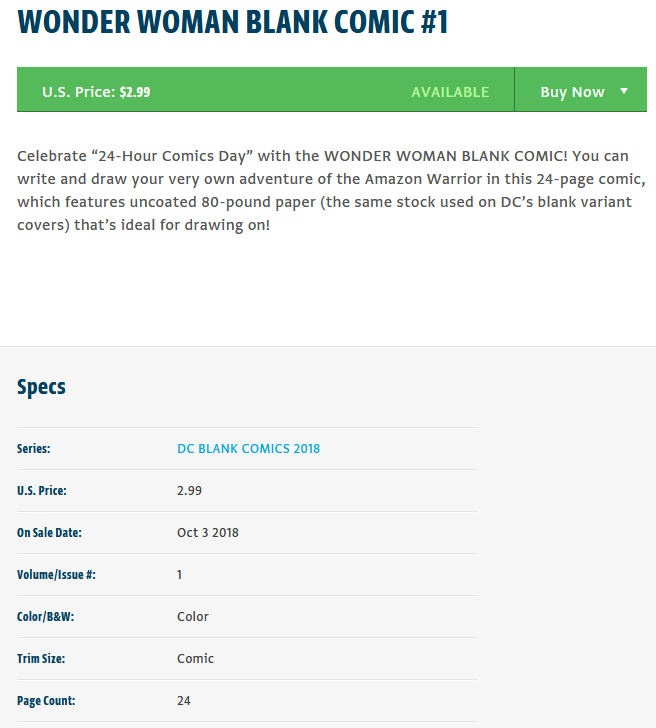 I have not seen the blank sketch comics that Will is referring to. However, DC has rebooted their comic book history several times the last few years and botched it up. Why not let the fans write and draw their own comic? It might be better than what DC can come up with. These books were sold in coordination with "24 hour comics day". The idea was for people to buy and create their own comic, hence why it's entirely blank. Here's the official blurb from DC's site. I personally bought one of each and am hoping to start a sketch book. Unfortunately, I imagine the cost will be astronomical. At that price, it shows how little the publishers must be paying the artists and writers since this is the bulk of the cost of a new book. Curious to know how much the Frank Miller sketch covers cost at the cons? Does Frank do these on a whim and doesn't look to pocket much or are these set up in advance. The blank books don't have any ads so that must be factored in. No idea how much the publishers make on ad placements since most of the ad pages seem to be marketing/promotions for their own products (TV shows, movies, other comics, etc). The blank books don't have any ads so that must be factored in. No idea how much the publishers make on ad placements since most of the ad pages seem to be marketing/promotions for their own products (TV shows, movies, other comics, etc﻿). Presumably, they are not paying themselves anything for their house ads. Even "in the day", how much could they be charging someone selling "sea monkeys"? Wow! That's a dangerous post. Everyone knows you don't mess with Big Monkey. I love to live dangerously. Still waiting for my electro-shock hand buzzer and x-ray eye glasses.